Tomb of Adham Khan, Delhi. bl.uk > Online Gallery Home	> Online exhibitions	> Asia, Pacific and Africa Collections	> Tomb of Adham Khan, Delhi. 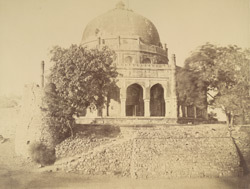 Part of a portfolio of photographs taken in 1858 by Major Robert Christopher Tytler and his wife, Harriet, in the aftermath of the Uprising of 1857.This tomb was built by the Emperor Akbar in 1526 for Maham Anga, his wet nurse and her son, Adham Khan a nobleman and general in Akbar's army, who was executed on the Emperor's orders for committing murder. Khan's mother passed away from grief soon after this. Around the central chamber is an arcaded verandah, above which rises the corona of the dome in which there are several passages, hence the tomb is also known as 'Bhul-Bhulaiyan' or labyrinth. It is one of the last in the Lodhi style tombs.